Gripset GC All Purpose Adhesive is a high performance, single part waterproof bedding compound used for fixing any of the GC sheet membranes. Based on silane modified polymer technology, GC All Purpose adhesive possesses outstanding adhesion and high early grab properties over a broad range of porous and non porous substrates. 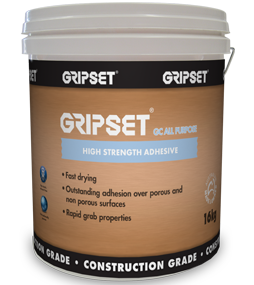 Designed to fix all the Gripset GC Sheet membranes for internal and external applications, providing a low viscosity, easily spreading adhesive with smooth consistent properties that can be applied to dry and damp surfaces. When used to fix the GC1 and GC4 sheet systems: 1.2m² per kg using a 2mm notch tooth trowel. © 2015 Gripset Inc. All rights reserved.